The increase in net worth this month was driven by the 10% discount that I got from repaying my student loans as predicted last month. This, however, was also the factor that drove my assets lower. Movement of cash into equities. I think in January equity markets will continue to be fairly quiet so I'm not expecting a large increase here. Until now I have not really made this blog public and I suspect that people have stumbled onto it through the blogspot world or else through random google searches. Twitter - @90millionblog. Every time I post or have a thought which is not really sufficient for a blog post I'll put it on twitter. I have now been using interactive brokers for ~2 months and while I am getting much more familiar with the way the trading system operates I discovered the first major disadvantage with the discount broker - you cannot participate in DRPs. While this is rather minor for a short term trader (the type of investor IB is targetting) it definetely impacts the investment decision for a long term holder / believer in the stock (i.e. one who is looking to add to their position) and this is effect is further compounded where the DRP shares are issued at a discount to closing. For example if the DRP discount is 1.5% and dividends are paid half yearly, the investor who cannot participate in the dividend is being diluted by 1.5% * (the proportion of investors that take up the dividend - typically ~30%)*(annual dividend) annually. Typically discounts on DRPs are availble for stable, high dividend paying stocks so if I assume a Dividend Yield of 6% (achievable on all ASX Bank stocks, property trusts and most utiltities) this results in an annual dilution of: 1.5% * 6.0% * 30% = 0.027% p.a. This may not seem like a big amount over any period of time however the big issue isnt so much the discount as is the ability to add to your position for free (as DRPs typically incur no trading costs) and this is where the big saving is. I currently have one high yielding property trust which I bought through interactive brokers which has a DRP plan with an associated discount that I cannot participate in. This does not worry me that much as it is a relatively short term trade. I am looking to buy some bank stocks in the near future however which look to be good long term trades and in this case I may buy it through my old (higher cost) broker in order to get access to the DRP. It came time (once again) for me to renew my car insurance and I wasnt surprised to see a rather large increase in my premium. The floods in other parts of the country coupled with extreme whether conditions were putting pressure on insurers profits and no doubt they were going to try and make this up with premiums across the board. I have no real loyalty to insurance companies (other than sticking to the big ones as I dont want to be fighting with small internet based insurance companies like Bingle, Budget Direct and Youi if and when I actually do have an accident). I decided to look around for a better deal. I know that a big deal is made of cost comparison websites such as iselect however I found that they do not cover all insurance companies. I suspect that they only cover those that give them commissions for referral which is fine from a business point of view but it also means that I'm definetely not going to use them! Having established there was no quicker way of doing it, I then went to all the insurers that I was willing to consider (AAMI, RACV, GIO, Allianz etc) and did the online quotes for all of them. Allianz came out ~$100 cheaper for comprehensive insurance than my current insurer (AAMI) was offering me. However I called up AAMI to see if they would price match and they did relatively easily and without hassle. The reason that you're able to save a fair bit of money by doing this is that insurers seem to love offering great deals to get new customers. An existing customer however is much more valuable from a profitability point of view (churn is expensive) so insurers are always willing to drop their premiums. Moral of the story - never ever renew your insurance premium at the offered rate! See my latest investing / business book review of Mark McCormack's "What they Dont Teach You at Harvard Business School"
As an aside, I haven't updated my book review site for investing books for almost 6 months. I was warned that the hardest thing to do with a website, especially a blogging one was to keep it up to date. While I do that with this site relatively often, Investor Book Review has somehow fallen through the cracks over the last 6 months. The one advantage I have is that book reviews dont really get stale so it does not necessarily need to be updated from week to week. Last week I was rather surprised to find a new credit card in the mail (not one of the application forms but the card already there ready to go). I was originally a little put out having ignored every single application they sent me for an increase in credit limit ($12k already is way too high but i figure I'll buy a car on it someday) but there is something about having the new card in your hand which is very tempting. My bank informed me that for now extra fees, no change in my credit limit and no extra requirements they were upgrading my card from a standard Awards card to platinum card. This seemed to be too good to be true so I read through absolutely every single piece of documentation and called them 2 or 3 times but in fact it turned out to be accurate. I'm not 100% why they did it but for the first time in my life I think I got a free lunch from a financial services provider. The increase in net worth this month is entirely due to the tax return I recieved from the government. This years tax return was large (in comparison to last year where I owed the government money) because it was the first financial year in which I got the benefits of my negatively geared property. Without the tax return my net worth would have been flat. This is due to the significant decrease in the value of my investment portfolio during the month. I have not been keeping track of the month to month movement in my stocks however overall my portfolio is down 12% from when I started to build it (the big negatives come from my pre GFC purchases which I still hold on to). Liabilities stayed broadly flat as well as I ended up using most of my free cash for a holiday. The upside is this liability did not increase at all during the month. December is the last month in which the government will give me a 10% discount if I pay off my student loans so I may use some cash on hand for that and get a 10% kicker to my net worth next month. I finally got around to setting up my new brokerage account and ended up going with Interactive Brokers. I just couldnt go past the number of currencies / markets I could trade in coupled with the amazingly low costs. The biggest downside so far has been the time required to set the account up. From starting my application to getting all my certified documents sent through and approved and funding my accounts it is a 1 - 2 week process (not the few days they suggest). I'm not completely sure how to use the interface just yet however it does not appear to be as user friendly as my old Commsec account. Hopefully this is because it has extra functionality as opposed to being an archaic system. I will post updates as I become more familiar on how to trade with this software. Now the big decission is what to buy with my first trade! I'm doing this evaluation early as I will be away when the month ticks over and I do not want to leave it as late as I did last time (for consistency). October's net worth figure was affected by a number of one off impacts including being paid out my entitlements from an old job which increased my pay significantly for the month. My long awaited tax return did not arrive as my tax accountant seems to have forgotten about my returns. Again, this will provide a decent increase in assets once it arrives. 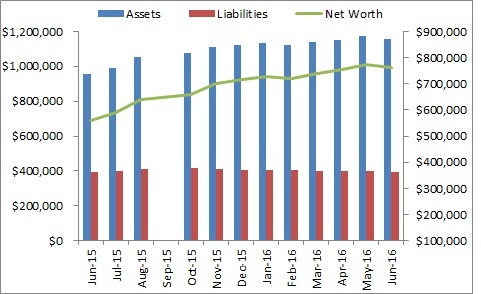 Assets suffered a net decrease in October for several reasons. Firstly I used cash to pay down significant outstanding credit card loans which were due soon after the last measurement. Further there was a drop in the value of my managed investments (which I only measure quarterly) however this was offset by the increased pay amount as well as an increase in my share trading account. Liabilities decreased significantly during the month with the significant reduction in the level of credit card debt. Given that I spent the last 2 weeks lounging around in the sun, I missed the build up to the OWS protests and so when I turned on the news was confronted with the sheer size of them. I then came into work and found that similar protests have started in my city as well. Is it possible that we are seeing the beginings of a Russian-style communist revolution? I dont know enough about early 20th century Russian politics but I do know that communism didnt work too well for them so am hoping that this is not the case. The net worth for September was actually calculated as at 17 October 2011 as I have not managed to get around to it before this point. My liabilities also increased significantly (+$16,000) and again this was due to me including items which were previously not included - in this case my HECS (or univeristy) debts which are government funded and which get paid out of my taxes. The significant increase in my net worth for August was due to my work bonus getting paid into my bank account as well as a small inheritance which I received. Both of these amounts are still in cash though I am looking to increase my equity market exposure as my investments (net of any gearing) are still 50% property, 30% interest bearing securities and 20% equities. I'm expecting a small bump to my net worth next month when I (finally) get around to doing my taxes. One the weekend I realised that I needed to renew my landlords protection and house insurance. Looking at the renewal amount I was surprised at how high the insurance cost was (~$840 which was a 30% increase from 2010). I was not surprised that there was an increase given how hard insurers got hit with the floods that affected Queensland however 30% seemed outrageous especially given that I live in a area which never has flood problems etc. I therefore got a quote from another insurer and then took it back to my insurer who lowered the cost significantly. This got me thinking about where else I was paying fees or costs that were too high. Since then I have renegotiated my bank account keeping fees (now paying nothing instead of $5 a month - same account - same everything...just no fees) and will be getting onto my phone next. The moral of the story is that you can get significant savings (i'm already above $150 p.a.) for very little effort - just have to get out there and ask. Market volatility - Buy, sell or hold? With the unprecedented amount of volatility in the market many people are torn about whether to buy more in the market, to sell or just to stay on the sidelines and see what happens. S&P 500 Index (ASX: IVV): You may wonder why I've put the ASX version of the S&P500 instead of just the regular US verison. The answer is simply the Australian exchange rate (which benefits me as an Australian). The S&P500 in A$ terms is now close to 10 year lows. When the price of the ETF dipped below $110 last week this was the all time low reached by the index. If you have any faith at all in the US economy this is a great buy for Australians. There is an in built protection as well in the exchange rate which is trading well above the long run average of 0.80 (currently 1.04). Given how strongly the markets are recovering there are not the same options as last week. I may stay on the sidelines a little bit longer until the crazy volatility hits the market again and I can pick up stocks on the cheap. The increase in net worth was less than expected due to negative movements in the value of my stock portfolio (especially from my U.S. holdings which now make up ~50 - 60% of my portfolio). Credit card debt as also up after a trip overseas however cash spend was down during the same period which allowed for a greater than expected level of investment. Tax returns and bonus payment next month should significantly increase August's net worth. Are the first cracks in China starting to appear? China in recent years has been the country that has underpinned much of the economic growth around the world. It's seemingly unstoppable growth has led to one of the biggest commodity booms ever seen. The demand out of China probably saved several commodity driven countries from really feeling the impact of the GFC (notably Australia and Canada). Getting accurate data out of China is notoriously difficult. The propoganda and government controls make it had to seperate fact from fiction. Many factories in China cater exclusively for the U.S. With the problems the US is having at the moment how is the Chinese manufacturing sector going to survive? China's projected growth is already factored into the stock prices of many entities so there is only downside risk inherent in companies that have a significant exposure to China. The dilemma in the above is finding stocks (especially global blue chip companies) that are not in some way dependant in China even through several degrees of separation. Interactive Brokers - Cheapest broker around by a long way and offers access to more markets than any other provider. Downside is that you require 10k minimum initial deposit AND US$120 of trading costs per annum which isn't great for buy and hold investors like myself. OptionsXpress - Not cheap relative to other online brokers but a very very intuitive system which has customer service in my area (and more importantly time zone). Downside is that it only offers access to US markets. Upside is that it is a super intuitive system to use. I'm leaning towards optionsxpress. I don't trade often enough for trading costs to really factor into my decision. Given that I am expanding my effort into the international arena - I think the US market will offer enough diversity to me. Until now I have been quite happy trading using Commsec, the brokerage division of Commonwealth Bank of Australia. Recently, however, I have been looking offshore for investment opportunities as everything is so expensive on the Australian Stock Exchange due to the commodities boom. I have been looking at stocks listed on exchanges from the NYSE to the HKSE and the Frankfurt exchange. I then checked out how much the brokerage would be through my Commsec account and found that they would be ~$100 per trade (US$107)!!!!!!!!! The more I look the more I find (for unbelievably cheap rates)...will update once I have researched some more. The attached article from the Daily Mail has been going absolutely viral on the internet. Wow - I wish I had that much in my checking account! Why does someone have that much in their checking account? Does that mean their investment accounts are many multiples of that? Why would someone with that much money in the account even print a receipt?! Anyway if you haven't seen it elsewhere - enjoy!